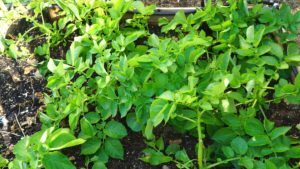 Welcome to a growing guide on how to grow the White Superior variety of potatoes. Fresh potatoes harvested from your garden taste much better than anything you can buy at the grocery store. Our first step is to prepare the soil in our raised bed we already have a lot of compost and organic matter added to the soil and what we are doing here is adding some azomite which is volcanic rock dust into a raised bed this will provide a lot of nutrients that the plants need to grow and the potatoes should do very well with this added in the soil. We will be planting our potatoes from seed potatoes that you can find in your gardening stores garden centers very easily now you can also buy potatoes from your grocery store and plant them but just make sure that you’re buying potatoes that have not been sprayed by growth inhibitors and if you go to some organic grocery store like Whole Foods or your local farmers market you might get those potatoes but most of the grocery stores spray their potatoes with growth inhibitors and you won’t be able to grow them. 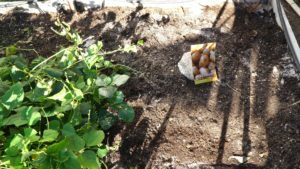 The best choice is to buy these kind of seed potatoes from the gardening centers they are mostly available around January here in Southern California. And what you do is you just plant them a few inches deep and this method of growing potatoes is the hilling method where we will be not planting the potatoes very deep but we will add more soil and hill those potato plants as they grow up. 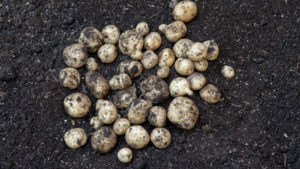 Now if you don’t want to do that what you can do is plant your potato sets very deep and I’m talking about like at least six to ten inches deep and then cover it with soil and they will take time to grow but that’s an alternative way of growing potatoes which we will try in the next season. And at this time it’s a good idea to add some fertilizer. You can add some complete all purpose fertilizer or you can use a tomato or vegetable fertilizer they will grow very well and you can see that the plants will continue to grow make sure that you choose a spot that receives at least six to eight hours of sunlight every day and you want to make sure that your plants get plenty of sunlight. If you see that your potato plants are flowering that means they’re doing very well that’s a healthy plant and the fact that they’ve also started producing tubers or their potatoes. This season our potato plants did not grow like 100% well they looked a little bit stressed and I think that’s because we had a few days of very high temps and then very low temperatures so that’s probably why our potato plants were not at their best. 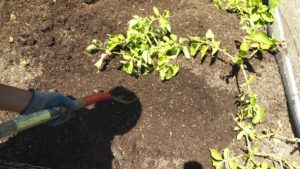 Once you finish hilling the potatoes, an important thing to do is to wash away the extra dirt that’s there on the plants that should make sure that your plant will get any kind of diseases the soil that’s left on the plants. Make sure you wash them very well, including the leaves and stems and then you need to water them well. After the potato foliage has started to die at about 120 days you can see that a lot of the potato plants have completely dry leaves and the plant is gone. I usually wait for about two to three weeks after this to harvest the potatoes but I do like to dig them out all at once so that I can have space for the next crop. So stop and look at how these potato plants grow in the next few days once you have stopped watering the potato plants and they will be pretty dry and this is because the potatoes need about two to three weeks to grow, before we start harvesting them. At 128 days we are finally harvesting our potatoes you can see here more than half the plants have now died and when we dig up the potatoes we are going to be finding the potatoes that have grown around the plant now potatoes do not grow very deep into the soil they do grow around the plants and they are right about at the place where we planted them, a few inches deep and then the soil that you hilled should be removed. The white superior variety of potatoes these potatoes don’t grow very large like the other varieties like the russet but they are absolutely delicious. When you grow potatoes in your home garden and especially when you’re not using any pesticides or fertilizers or you’re just basically just growing a potato by planting it in the soil you can expect to get about three to four potatoes per plant. 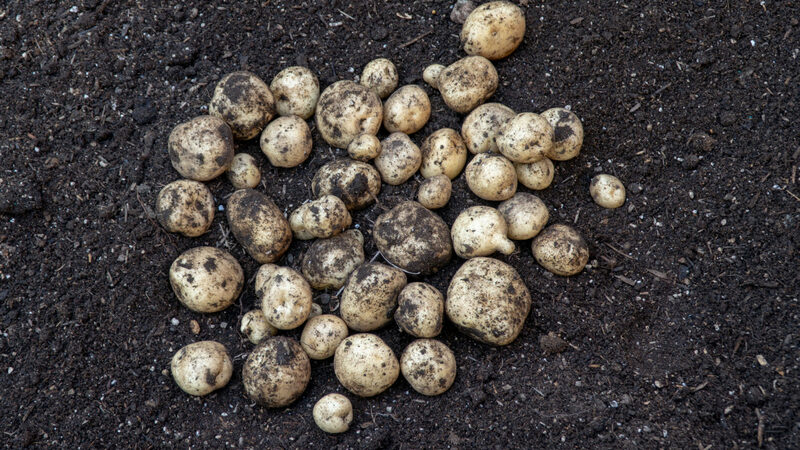 If you get more potatoes that’s good for you you’ve got a good harvest and usually the yield is more when you’re growing in native soil in some areas but otherwise don’t be disheartened if you don’t get a big harvest when you’re growing plants at home. You are able to experience the freshness and goodness of growing these at home so it’s not really a race to grow a bumper yield or a large harvest what you want to get is a decent harvest which you can use consume within your family and of course if you have extra you should be sharing that with your friends and neighbors. These are the potatoes that we harvested from a 16 square foot raised now the volume is not that high as you can see here. After harvesting, wash them very well. Our harvest was quite a lot of potatoes that our family could consume for the next one or two months at least. So it’s a decent harvest and we’re not going to be storing our potatoes now we’re gonna be consuming all of these potatoes pretty quickly so after washing them. All we’re gonna do is dry them a little bit in the sun just so that they form a little bit of a cover but you don’t really need to keep them out for a long time. Home grown potatoes are absolutely delicious potatoes that will serve you for a long time. Whether you are growing White Potatoes or a mix of Colored Potatoes you will have great and tasty potatoes in your garden. 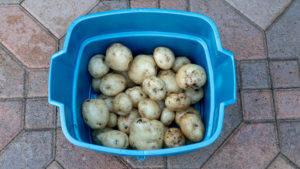 So there we have it folks that was our blog post on growing potatoes using the hilling method in raised beds let me know what kind of potato varieties you like to grow and let me know if you have grown potatoes this season or are you planning to grow them now and what varieties are your favorite varieties? Drop in a comment below!